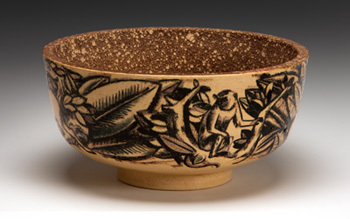 An examination of both the cohesiveness and the diversification found within the Los Angeles area post World War II clay community. 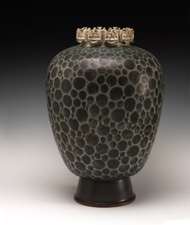 Presented by The American Museum of Ceramic Art (AMOCA), the collection of 300 ceramic objects by 53 artists working in studios, classrooms or industrial environments illustrate the tremendous growth and experimentation in ceramics at this specific time. 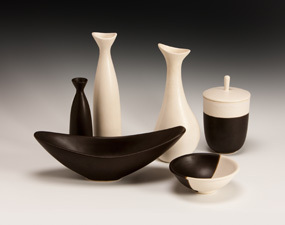 Because of the huge number of Los Angeles area ceramic artists that might have been included in Common Ground, selection was guided by an decision to choose those who had a direct connection to artist, art administrator and designer Millard Sheets (1907-1989). 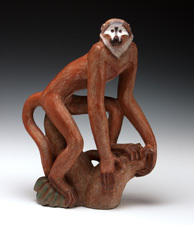 His dynamic personality, inspirational teaching and business savvy brought recognition to a large group of artists and craftsmen, including many ceramists. Although not the prime focus of the project, Sheets is the common denominator - "the glue" - among the cast of characters. To commemorate the show, I was honored to be selected as photographer for the 204 page hard cover book by the same title as the show. The book contains 93 photographs from the exhibit with most of the images being full page color plates. 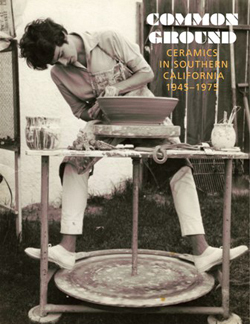 Both the show and book are a featured component of Pacific Standard Time: Art in L.A 1945-1980. Pacific Standard Time is an initiative of the Getty with arts institutions across Southern California. The show runs through March 31, 2012 at AMOCA in Pomona, California.